Pride Park Stadium, Derby: 7,183. 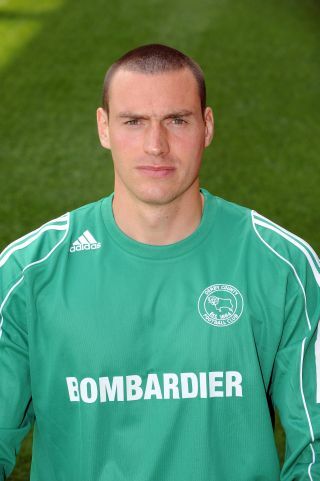 Stephen Bywater  – GK – Overall didn’t have a great deal to do but did what he needed to with minimal fuss. Made a couple of saves from close headers that looked comfortable, going straight to him, but Bywater deserves credit for his good positional sense. Distribution was only really a problem for the six minutes the Rams were behind when it was more noticeable. 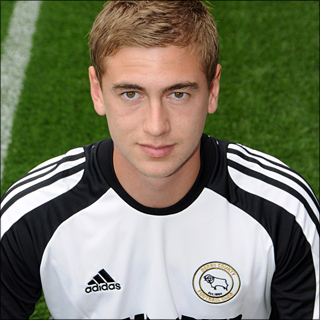 Made a brilliant save at full stretch from Danny Schofield’s spot kick, to give Derby County the vital edge in the penalty shootout, and become the hero of the hour. Paul Green  – RB – With Robbie Savage and Stephen Pearson looking like Nigel Clough’s preferred pairing in central midfield, the manager solved the problem of how to fit Green into the starting 11 by playing him at right-back. Again out of position, Green looked more comfortable at right-back than he has in a wide right midfield position. He held his position well, challenged in the air, and won tackles. A little shaky at first, Green grew in confidence as the game wore on, particularly once Shaun Barker had replaced Miles Addison. Added an extra dimension with good distribution and wasn’t afraid to cross the halfway line and support the attack. Miles Addison  – CB(R) – Struggled throughout with a foot injury which, it appears, he was carrying before the start of the game. Aggravated the injury when he got caught out by Lewis Grabban, and was fortunate not to concede a free-kick as he wrestled the Millwall player in an attempt to keep Grabban in his sights. Replaced by Barker on 41 minutes. Jake Buxton  – CB(L) – A much improved performance saw Buxton put in a very solid game defensively. Started a little shakily as it seemed he and Addison were unsure who was meant to be going and winning the ball in the air. Did win a lot of headers, put in some very strong challenges early on, and looked much better once Barker was introduced. Caused problems in Millwall’s penalty area and nearly created a goal when he headed a Kris Commons cross across the goal mouth but no Rams player was there to take advantage. Dean Moxey  – LB – A much improved performance from Moxey. He defended well, both in the air and on the deck, and got forward more than usual to support the attack. Did get caught out of position a couple of times, but generally had a very good game. Stepped up right at the end to send David Forde the wrong way and score the penalty that won this F. A. Cup 3rd round replay for the Rams. Lee Croft  – RM – Made a lovely pass early on to put Stephen Pearson clean through with just the goalkeeper to beat. Produced a very good cross, later on, that Pearson headed wide. Had a good opportunity to shoot, after a mazy run, but opted to lay the ball off instead. Worked hard, closed down Millwall well, and tackled … but generally wasn’t involved in the game enough when Derby County had possession. Substituted on 62 minutes. Robbie Savage  – CM(R) – A hard working, energetic display from the Rams’ captain. Saw a lot of the ball, knitted things together, and passed it well to retain possession. Closed Millwall down and made good challenges to win the ball back, not just tackling, but also in the air to win headers. Led by example as captain and stepped up to score Derby’s second penalty. Stephen Pearson  – CM(L) – A high work rate and commitment, Pearson made good runs, challenges, and was more involved in than in previous games. Tended to concede possession too easily though, either from overrunning the ball or misplacing passes. Should have given the Rams the lead early on when a brilliant run saw him clean through with just the goalkeeper to beat. With a choice of shooting, or squaring the ball to Chris Porter for a tap in, Pearson opted to shoot and Forde pulled off a good save. Later Pearson headed wide from a good cross by Croft. Swapped with Lee Johnson and played wide left from the start of the second-half. Produced a magnificent low cross that deserved a goal, but Chris Porter smashed his shot against the crossbar. Got on the end of a Gary Teale cross but his header was blocked. Lee Johnson  – LM – Started out on the lef, held his position better than against Scunthorpe United, but isn’t a wide midfielder. Moved into central midfield at the start of the second-half. A lively performance, always looking for the ball, and demonstrating a wide range of passing from simple square balls to raking cross-field passes. Better with the ball, than without it, Johnson did show a determination to close Millwall down. Kris Commons  – SC – The brightest spark on the field for Derby County and looked like the most likely Rams player to make something happen. Displayed a good touch, distribution, and ability to run at Millwall with speed and trickery. Not afraid to shoot, Commons fired a long-range effort narrowly wide just before the break, and floated another shot wide shortly after the restart. He also slammed a first-half free-kick into the wall. Moved out to wide right midfield when Steven Davies came on and, although he produced a great cross in the second-half which Buxton headed across the face of the goal, he made less of an impact. Substituted on 79 minutes after running out of steam. Chris Porter  – SC – Showed good mobility and ability to go and win the ball in the air, but wasn’t too effective holding the ball up. Looked better linking play when the ball was on the deck, rather than at chest or head height. Only narrowly wide with a first-half header. Turned inside the penalty area but sliced a first-half shot wide. Rattled the crossbar from eight yards out, after good work by Pearson, on 67 minutes. Allowed Morison to get away from him to give Millwall the lead with only 12 minutes of extra-time remaining. Stepped up to score Derby’s third penalty. Shaun Barker  – CB(R) (for Addison, 41) – Showed no sign of the injury problems that have beset him this season and settled seamlessly into the Rams back four on 41 minutes. Took responsibility to go and win the ball whenever it was in the air, which made it easier for Buxton to play alongside him. Strong on the deck too, Barker read the game well, was always looking around to make sure he was in the right position, and helped Green and Buxton by talking and directing them. Made a nuisance of himself in Millwall’s penalty area and had a good shout for a second-half penalty when he was blatantly shoved in the back. Steven Davies  – SC (for Croft, 62) – Put himself about and caused Millwall problems. Not too effective winning the ball, or holding it up, but looked dangerous whenever he had the ball at his feet and could run at the defence. Headed a Teale cross straight at the goalkeeper. Hit a direct free-kick over the bar in the first period of extra time. Scored a brilliant equaliser with six minutes of extra time remaining when he burst through Millwall’s defence, beat two defenders, and sublimely chipped the ball over goalkeeper Forde and into the back of the net. Stepped up to score Derby’s first penalty. Gary Teale  – RM (for Commons, 79) – Within five minutes of coming on, Teale had delivered two fantastic crosses. The first saw a header by Pearson blocked, the second saw Davies head straight at the goalkeeper. Unable to make much of an impact after that. Under no pressure, played an awful back pass to Bywater which gave Millwall the corner from which they took the lead on 108 minutes. Stepped up to score Derby’s fourth penalty. Substitutes not used: Saul Deeney, Paul Connolly, Jay McEveley, Rob Hulse. Derby County Mad is on facebook. 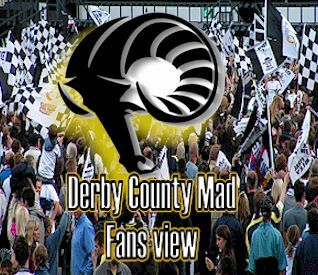 Search for “Derby County Mad” and join the group.